"My most frenzied critics work to keep Poroshenko afloat." The leader of the Fatherland party Yulia Tymoshenko accused President Petro Poroshenko of organizing a libelling media campaign against her. "I got used even back in the times of Yanukovych that when I say realistic things and call crime a crime I got reprisals in return, up to being sent behind bars. Poroshenko and his regime are no exceptions. Look: my most frenzied critics work to keep this corrupt regime, save Poroshenko and cover his schemes," Tymoshenko said on Thursday, 17 November. At the same time, she said that as a believer she does not hold grudge against anyone who uses "dirty methods of political struggle" against her. 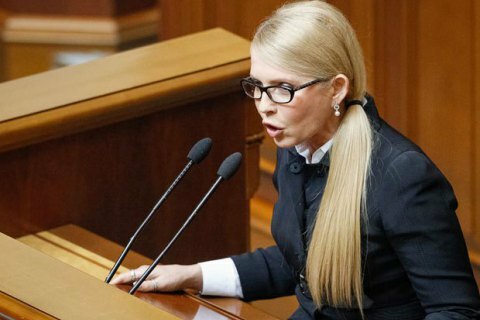 Tymoshenko explains the smearing campaign against Fatherland has started after the party took interest in the circumstances of the bankruptcy of 83 Ukrainian banks. "When I started working with the cheated depositors of the bank Mykhailivskyy, we have discovered facts that have become a real bomb: of 83 destroyed banks, the confiscated assets of 68 banks, that were very liquid, amounted to 448bn hryvnia," said the leader of Fatherland.